Many of us have thought from time to time that it would be great to have access to a time machine, so we could go back in time to meet people who lived before us or to witness a certain pivotal moment in history. Well take a deep breath, your opportunity has arrived. 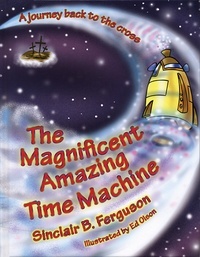 In The Magnificent Amazing Time Machine you will be taking a journey back in time. So get on board the time machine that will take you back to the Cross and the beginning of time itself. Along the way you will encounter the apostle Paul in prison, Peter, Jesus’ disciple sitting outside an empty tomb, Daniel inside a lion’s den, Moses leading God’s chosen people across the Red Sea, and many other important people found in the pages of your Bible. Hurry up and join this great adventure where you will learn about God the Father’s Plan to give his one and only Son to save sinners.